A real buzz is expected in and around San Mames on Friday evening when Athletic Bilbao and Real Sociedad take on each other in the huge Basque derby to raise the curtain on the Matchday No 8 in La Liga. The hosts will come into it in higher spirits following an impressive showing in a 1-1 draw to Barcelona last weekend away at Camp Nou. They thus responded well after the inaugural defeat of the season which came last Wednesday (0-3) to Villarreal at San Mames. It was right-back Oscar de Marcos who notched the goal for the Lions at Camp Nou. The four-man defense with two defensive midfielders resisted Barcelona’s attacks successfully all up until the 84th minute when substitute Munir tapped in Messi’s ball to set the final score. Sociedad have an opportunity to make it all square in the H2H record with fierce Basque rivals at 14 wins each with a three-pointer here. However, we have to mention that Txkuri-Urdinak bagged just four wins in 23 matches against Bilbao at San Mames. Real Sociedad took four points from two Basque derbies in the previous tem of Primera Division. The two sides met each other in a pre-season friendly in early-August when Bilbao took a narrow 1-0 victory. Eibar head to Girona in this Saturday’s early game in La Liga and they do so in the knowledge that victory could propel them all the way up from 17th into the top half. It’s still early days in the season and it’s not easy to predict which of these teams will ultimately end up having the better season. Both sides would most likely see a mid-table finish as a success again. Girona are the more ambitious of the two clubs. Their link-up with Manchester City has the potential to see them grow in stature further but they’ve already come a very long way in a short time. The departure of Pablo Machin to Sevilla in the summer was unquestionably a blow though and new boss Eusebio is yet to really stamp his authority on this side with a mixed start that has produced 2 wins, 3 draws and 2 defeats. Eibar won both meetings 4-1 last season. Those were the first to take place in the top flight. 4 of the last 5 overall have seen both teams score. That’s probably about right. Getafe invested quite heavily by their standards in the summer, although principally it was an investment in the squad rather than merely the starting eleven. One of their main signings was Jaime Mata, a goal machine in the Segunda Division last term and he opened his Getafe account on Monday as his new side came from behind to draw 1-1 at Celta Vigo. They’ve got some impressive results this term, including a fine win at Sevilla but they need to get better at putting the weaker teams away in front of their own fans. That will be the challenge for them here against a Levante side that has shown some pretty big cracks since an impressive 3-0 win at Betis on match-day one. They did at least managed to halt a 3 game losing streak last time out though with a 2-1 home victory over Alaves. This though you sense will be much tougher. The last 6 meetings overall have produced 2 wins each and 2 draws. The last 6 at Getafe have seen each side win 3. Real Madrid have won all of the last 9 meetings. They last dropped points against Alaves in October 2001 but have won on their 4 visits to Vitoria since then, scoring 14 goals in the process. Like Leganes, Rayo feel as though their performances have warranted more than the 5 points they’ve amassed so far. They come into this match on the back of two 2-2 draws against Real Sociedad and Espanyol. Slowly they seem to be warming to the task of top flight football although they will need to keep their discipline here in a derby match, having already thrown away their chances of getting a result against Alaves with an early red card. They actually lost that match 5-1 but their performance wasn’t actually that bad and they do look to have a goal or two in them with Raul De Tomas impressing up front while Gael Kakuta is a much more consistent performer these days on the wing. They’ve taken 4 points from their 3 away games so far, a decent return and the only road match they suffered defeat in was against Atletico Madrid and they were a little unfortunate that day. Surprisingly this is the first competitive meeting in the top two divisions since March 2004 when the sides drew 0-0 at Vallecas in the Segunda Division. In all competitions, Leganes have failed to win against Rayo in their last five games (D2 L3), all of them in Segunda Division B. This Sunday’s early game in La Liga sees two newly promoted sides meet and two of the pre-season relegation favourites. Huesca made the brighter start but increasingly it is Real Valladolid who are settling better into life in La Liga. They could climb towards the top six with victory here and that would give them an excellent platform from which to build in their first season back at this level. Valladolid failed to net in any of their opening four games but things dramatically turned around for them on match-day five in Vigo. 2-0 down inside ten minutes, the writing seemed on the wall but out of nowhere they found their shooting boots. They came away with a 3-3 draw and have recorded back to back victories since then including a surprise 1-0 win at Villarreal last time out. Therefore the hosts should take real confidence into this game. However, the same can’t really be said of the visiting team. Huesca’s early season bubble was burst pretty emphatically when they lost 8-2 at Camp Nou. They’ve now taken just 1 point from 5 matches to fall down into the bottom three. It is still early days and they have also visited the Wanda Metropolitano so they’ve had two matches they wouldn’t have expected to get anything from but it’s matches such as this that will determine whether or not they stay up. This will be the first ever top flight meeting between the clubs. The two Segunda Division meetings last term both produced home wins and away red cards. Huesca have won 4 of the last 6 meetings overall. Atletico Madrid face a difficult test against a Real Betis side with whom they are level on points in La Liga table, but are fancied to edge out the visitors. Going into the eighth round of matches, the standings are much more congested than might have been expected with all of the top clubs having dropped plenty of points so far. Consequently, both Atletico and Betis are only two points behind Barcelona and Real Madrid and one adrift of Sevilla, each of the duo in fourth and fifth positions having suffered just a solitary defeat so far. Betis are a steadily progressive side, generally very solid at the back having kept seven clean sheets out of nine this term including two out of two in the Europa League. That is defending straight out of the Atletico Madrid manual which has been implemented for several years now by Diego Simeone’s team and they too, as usual, are proving very hard to break down just now. This game sees Espanyol aim to build on a pretty impressive start to the season, particularly in front of their own fans. Not a great deal was expected from them this term but they’ve made a solid start and new boss Rubi looks to have got them organised. It has been a less convincing start from Villarreal but once everything settles down, they are certainly the team that should be in for the better season. They come into this one having played in Russia in midweek. An entertaining 3-3 draw at Spartak Moscow came as a bit of a surprise given their league matches this term have averaged just 1.29 goals per game in total. No other side in La Liga’s matches have produced fewer goals and with Espanyol also looking pretty solid at the back, it’s hard to see this one being particularly open. Espanyol have been excellent at home so far this season, winning all of their 3 games at the RCDE Stadium to nil. That goes a long way to explaining why they are the clear favourites here while Villarreal’s long trip to Russia may also be a factor in that. The Barcelona club currently have a 3 point advantage on their opponents and could even gatecrash the top four this weekend with victory depending on other results. However there is reason to think Villarreal can get something from this game. Firstly they did rest a lot of players in Moscow and have plenty of fresh legs to bring in here, including Gerard Moreno who they signed from Espanyol in the summer. The Yellow Submarine have actually been much better away this season too with 2 wins and 2 draws from their 4 road games in all competitions. 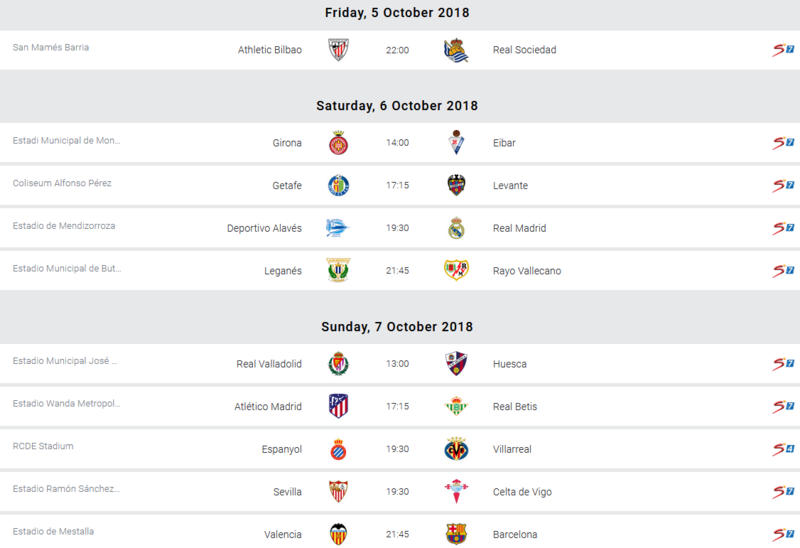 They’ve had some tough ones too with Sevilla and Athletic Bilbao already visited in La Liga, the latter resulting in an impressive 3-0 Villarreal win. Four of the last 5 meetings have been drawn. Meanwhile 5 of the last 6 at the RCDE Stadium have ended level including all of the last 4. Espanyol have won just one of their last 19 games against Villarreal in La Liga (D10 L8). This has the makings of one of the most entertaining games this weekend in La Liga. It features a Sevilla side that has been full of goals lately against a Celta Vigo outfit that also favours an attacking style of play and tends to be involved in high-scoring matches. The Galicians have tailed off slightly though following a very bright start under their new boss Antonio Mohamed. Since beating Atletico Madrid 2-0 at the start of September, Celta have failed to win any of their four matches. They’ve surrendered leads to only draw at home to both Valladolid and Getafe and that will be a source of real frustration to Celta fans as it was a recurring theme at home last term. Overall 10 points from 7 games represents a pretty solid start and they will be hoping to at least put themselves in the frame for European qualification. That will be the very minimum goal for Sevilla and some of their performances suggest they could get close to the big three in Spain this season providing they can handle the extra demands of a long Europa League campaign. They were beaten in that competition on Thursday, going down 2-1 at Krasnodar. It should only prove a minor setback for Pablo Machin’s men though and they did rotate pretty heavily so they should have plenty of fresh legs to bring in here. One of the rested players was Andre Silva, who has been prolific in La Liga this term. The Portuguese international has fired in 7 goals in 7 games so far this season making him the top scorer in the Spanish top flight. He has already put a nightmare campaign in Italy behind him and backing Silva to score anytime appeals here against a Celta defence that doesn’t always convince. The most recent meeting in April saw Celta hammer Sevilla 4-0 at Balaidos. Sevilla have won 4 of their last 5 at home to the Galicians though. This Sunday’s clash is the final game in La Liga before the international break and it promises to be a good one. Both sides secured excellent results in England in the Champions League in midweek but haven’t totally convinced in La Liga yet. Despite that Barcelona still top the table heading into match-day 8 and they remain the team to beat. Having gone 3 league games without a win, they headed to London to take on Tottenham under pressure to put in an improved performance. They certainly did that with Leo Messi scoring twice as Barca won 4-2 at Wembley in what was their best away showing in Europe for several years. It has helped deflect some of the criticism that had been heading Ernesto Valverde’s way and he would have been relieved to see some of his key men put in big performances after a slightly sluggish start to this term. Valencia meanwhile drew 0-0 at Old Trafford in midweek to raise hopes they could potentially pip Man United to 2nd place in their Champions League group. Their league form does leave a lot to be desired though. They’ve only won once so far this season and no side in the Spanish top flight has won fewer games. They also have the joint worst goalscoring record in the division and that will be of greater source of concern to Marcelino heading into this one. On paper they have some excellent strikers. Kevin Gameiro and Michy Batshuayi were smart summer additions and Rodrigo has been a revelation over the past 18 months or so. However they haven’t quite found the right balance in the final third yet this season. While they managed to scrape a result against what is currently a slightly toothless United side in midweek, you sense it could be a different matter here. Barcelona’s recent league slip ups were largely the result of rotation not working. However in a tough game like this and with an international break coming up, it seems pretty certain that Valverde will go with his strongest possible eleven. Barca have won 5 of the last 6 meetings overall. Valencia have only won one of their last eight La Liga games against Barcelona (D2 L5), with that win coming away from home (1-2 in April 2016).